Today I worked on drawing with letters. 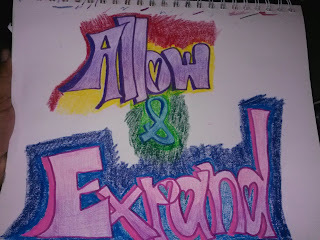 I've wanted to start trying out different lettering styles, I'm using one of my favorite mantras: Allow and Expand. I'm trying to manifest this in my life. I used the following: Sharpies Markers, Prisma Watercolor Pencils, Art Stix and Verithin Color Pencils and Staedtler Watercolor Crayons.